Maps of many of the Greek Islands are very poor compared with say, OS maps of the UK or the IGN maps of France. So, for many islands, is the level of detail on Google Earth. Some footpaths are very good, others are difficult to find and follow, few are shown on maps. Walk books are sometimes available and can be helpful but are usually purely descriptive. Therefore walking guides are being prepared which use a combination of photographs of key way-points and GPS referencing using the international default WGS84 as well as description. Descriptions of walks for three islands have been completed so far, on the Dodecanese islands of Symi and Nisyros and, using an older format without grid references, 3 walks on the Saronic island of Hydra. More walks are in preparation on Symi and on Nisyros and will be added as time permits. Symi is a small island with plenty of opportunity for walking on many paths and 'kalderimia'. Some of these are easy to find and follow, others are more challenging. A few are damaged by road construction. Walk 1 - to Viewpoint above Horio. 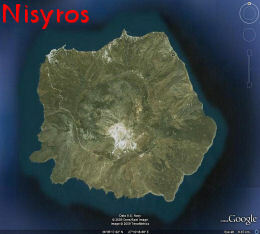 Google Earth now shows Symi at fairly high resolution. Fly to Symi with the link below and zoom in to see these walks plotted from the edge of the built up area of Horio to the placemarked destinations. Zoom in to look at details of the paths on the ground. Activate and click placemarks for information. 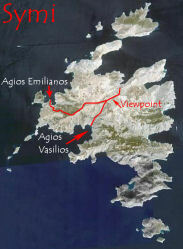 Nisyros is unique in the Dodecanese in that a useful diagramatic walking map has been prepared using GPS readings by a regular visitor.